The American Civil Liberties Union may sue Escondido, California after its planning commission rejected a proposal for a 96-bed shelter for illegal alien children. A north San Diego suburb’s planning commission on Tuesday ratified its rejection of a proposed 96-bed shelter for unaccompanied immigrant children who are arrested by the Border Patrol, while the American Civil Liberties Union said it was mulling a legal challenge. 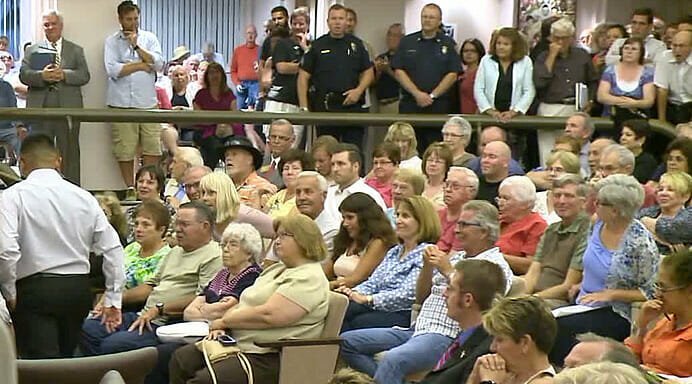 About 200 people packed into City Hall chambers, and a large, overflow crowd cheered and jeered below an outdoor speaker as Escondido commissioners heard impassioned pleas, mostly from people urging them to reconsider. “Shame on you!” members of the crowd shouted after the panel voted 6-0 to uphold its decision from last month. The proposal has sparked the latest controversy over immigration in Escondido, a city of 150,000 that has been rocked during the last decade by disagreement over how to treat people who are in the country illegally. The commissioners held no discussion among themselves after nearly three hours of public comment. Anyone can appeal to the City Council, setting up another likely showdown in August. David Loy, legal director of the ACLU of San Diego and Imperial Counties, said at a news conference earlier Tuesday that Escondido may be violating state and federal fair-housing laws against discrimination.